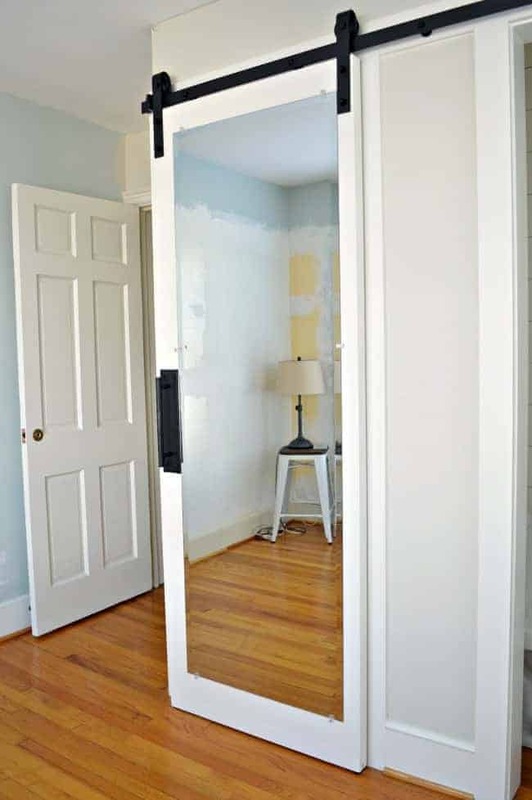 Our new bedroom closet and a DIY cheap barn door with mirror from an old wood door. At long last I’m ready to start sharing our powder room and closet project. 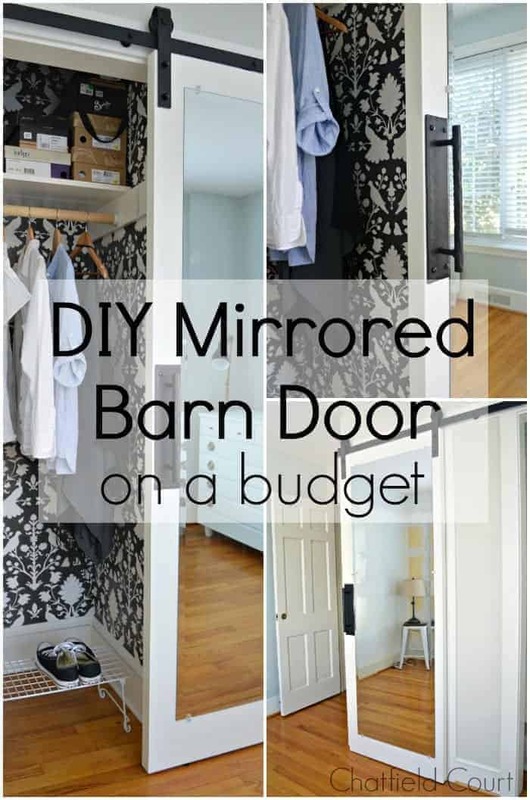 Let’s get right to it and kick things off with our inexpensive barn door with mirror and finished closet. 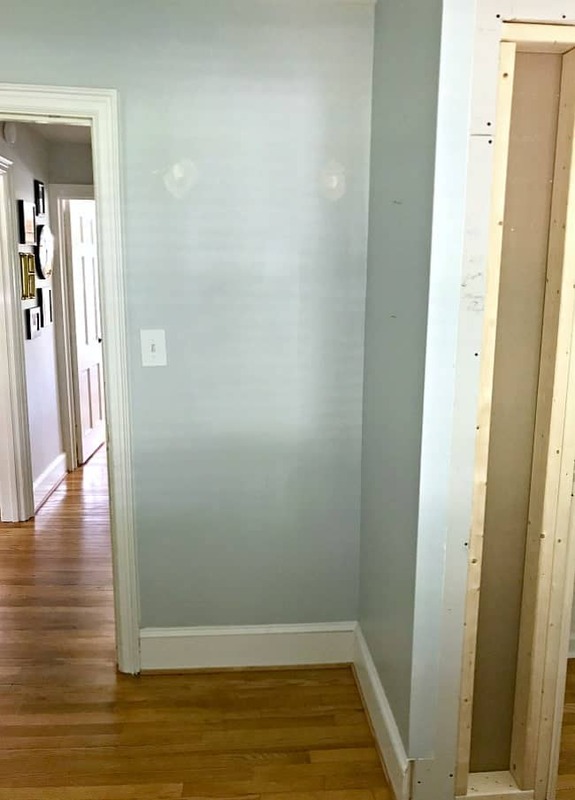 We started this project last year with a plan to turn a small closet in the guest bedroom into a small powder room. Tiny is more like it. Anyway, after we started construction we decided that we needed to try to add a closet. Not only did we need the storage but if we ever have to sell this house, it would be important for resale. There was dead space next to the new powder room so that’s where we decided to add the new closet. It’s definitely smaller than the one we used to have but it serves the purpose. Once we figured out the logistics, we worked on framing it out and then hung the sheetrock. 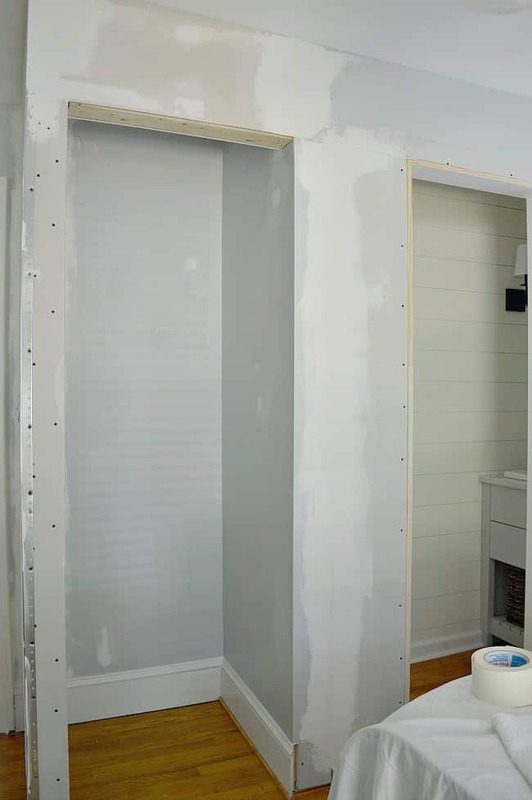 You can see the whole process in our post on building a bedroom closet. 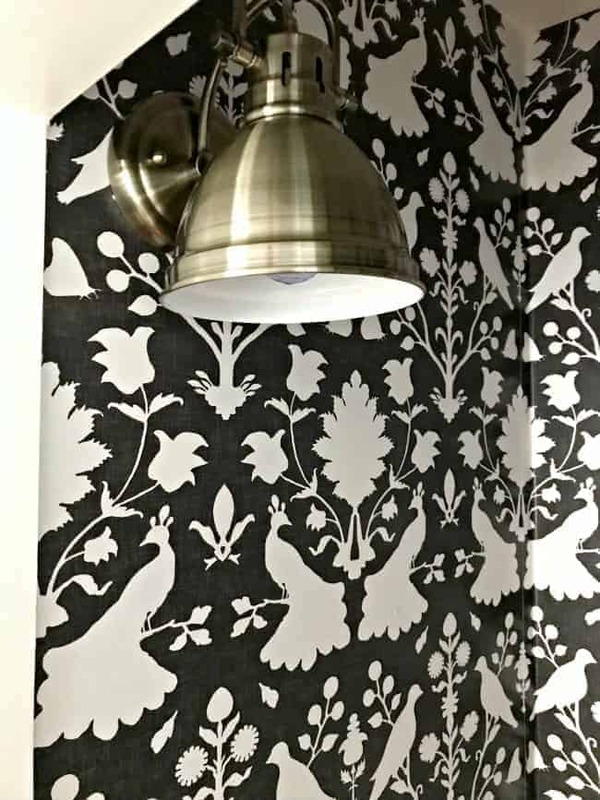 With the build done, we hung wallpaper and added a new light (the light was purchased here). The molding and a shelf and rod were the finishing touches. Next we had to figure out the door situation. Not an easy task when you can’t agree on what to do. We knew that we needed to do barn doors, because there isn’t room to open a door, but we couldn’t agree on what kind. 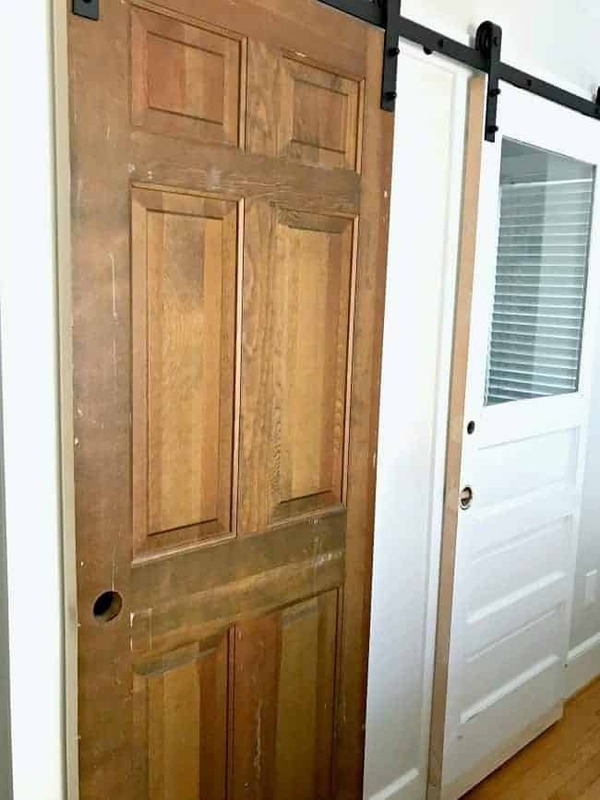 If I see an old door I love, that’s in good shape and at a good price, it comes home to live with my other doors. I’ve already used one for my front door and I have plans for several others. The door we used for the new closet is solid wood and was picked up at a Restore for $15. Too good to pass up, right? Before we could start working on our doors we had to hang the barn door track and attach the doors. We needed to check and compare length, thickness and width. A step that’s very important. Unfortunately we had several issues with the closet door. If you look at it you can see that the panels aren’t the same as the powder room door. A few other issues were that the door was too wide, it was too short and it wasn’t as thick as the powder room door. Kind of daunting but with a some thought (and more than a few discussions), we we able to address each issue…one by one. First we cut some of the width so it would fit the opening. Then we added wood to the bottom of both doors to make them the same length. 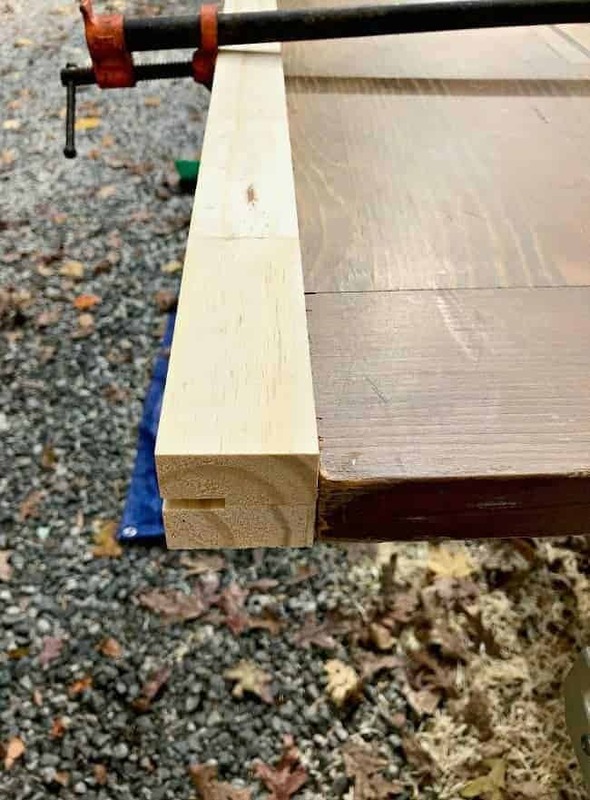 We also cut a groove in the new wood on the bottom so the door would glide in the bracket on the floor (this keeps the door from swinging in and out from the wall). The next step was to make the door look chunky (the same thickness as the powder room door) by adding wood pieces to the sides. All of this is happening on the inside of the door so no one will ever be able to tell. It doesn’t look pretty but remember, no one will see it. Once we were sure about the length and thickness, we took the doors down, puttied, caulked and then sanded them. The overall goal was to make sure you couldn’t tell that we added on. Next, it was time for me to paint. I ended up giving it 5 coats of Benjamin Moore White Dove, Advanced, Satin, on each side. Fresh paint makes everything look better. With the door painted we moved on to the last step, adding a mirror to the front. This was going to solve the issue of using mismatched doors (by covering up the panels). I really wanted a full-size mirror anyway and this seemed like the perfect spot. Finding a mirror that was big enough wasn’t an easy task. We needed a specific size so it would clear the handle and door brackets. I started looking and couldn’t believe the prices. The only one that I was able to find at the right size was $200. Ugh…not exactly good for the budget. Our last hope was a leaning mirror that we’ve had since we lived in Illinois. It’s been floating around the house without a proper place to live so the plan was to sell it. I figured we didn’t have anything to loose so I measured it and it seemed to be the size we needed. 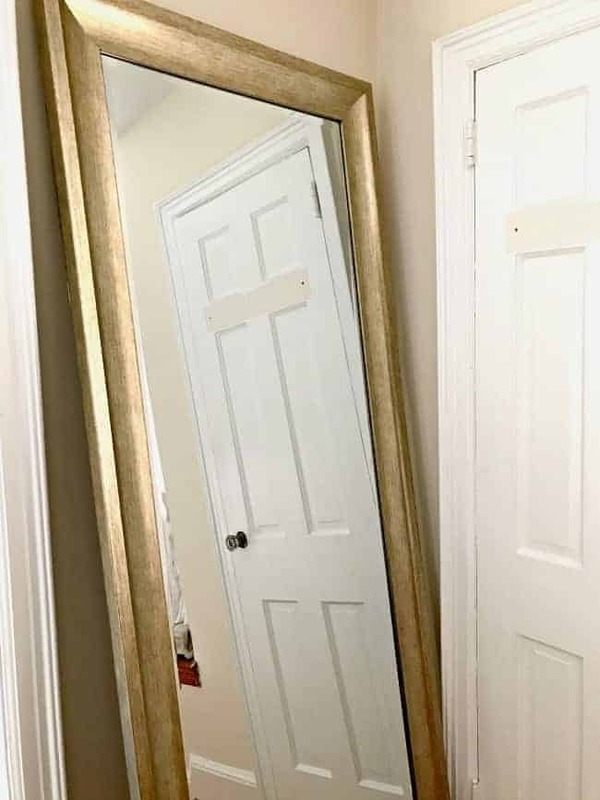 We weren’t sure what the mirror under the frame would look like, or if we could easily take it apart, but I convinced the hubs to give it a try. We took our time and carefully took it apart. If you look closely the edges of the mirror are dinged in a few spots but otherwise it looked good and was the right size. All we had to do was buy a $2 pack of mirror mounting clips and attach it to the door. We held our breath while we hung it up but it all worked out and looks great. The last step was to attach our custom iron handles. 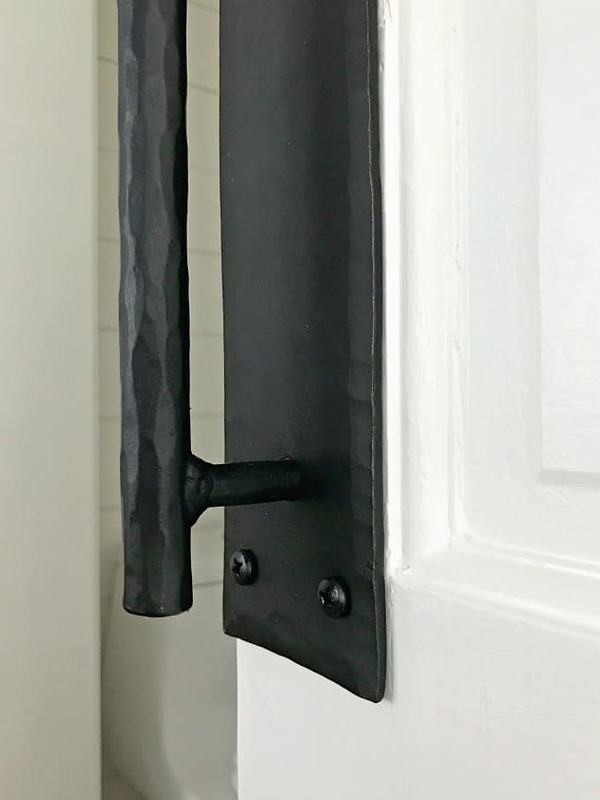 Besides the barn door rail, these were our biggest splurge. They had to be custom made because we needed a certain size to cover the old door knob and lock holes. Ok, are you finally ready to see? This room is still under construction so the reflection isn’t the prettiest. 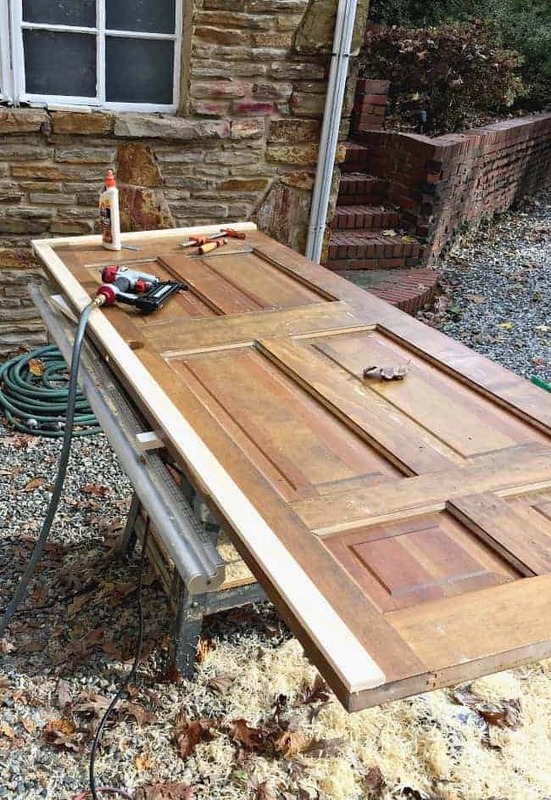 Let’s marvel at the finished barn door instead. This project was filled with challenges but we’re thrilled with the way it all turned out. And now it’s a brand new closet. Check out the fit of the mirror. It’s perfect! 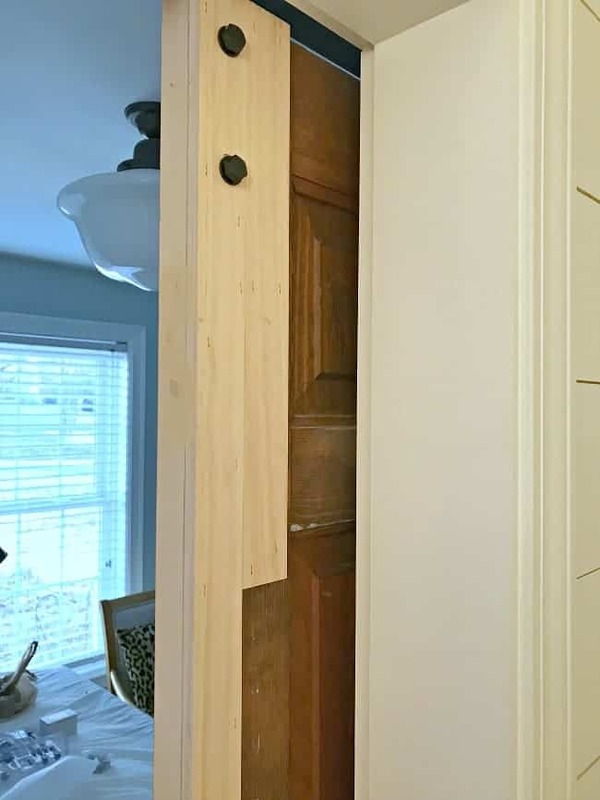 It’s the same thickness, width and length as the powder room door, with no obvious signs of the modifications we made (unless you stand in the closet and close the door). Thanks for sticking with me through this long post (and the months of waiting for us to finish)! 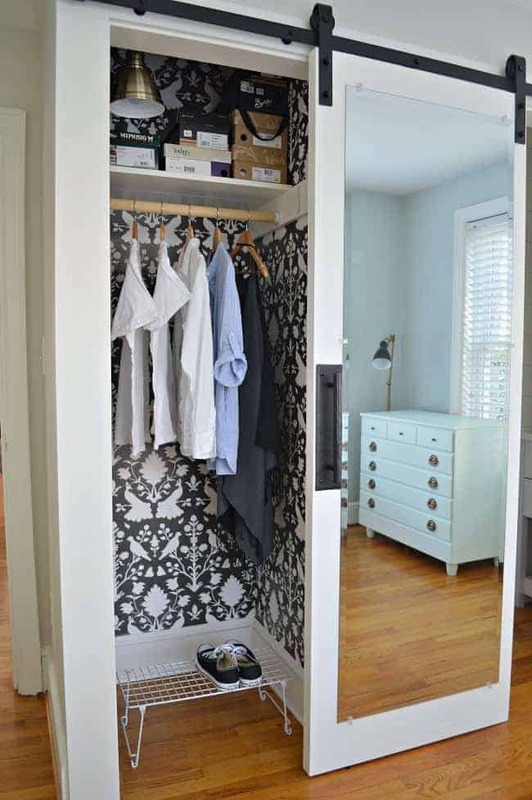 Want to check out some of the other powder room/closet posts? Check out the DIY vanity post and the wallpaper post. Don’t forget to check out the powder room reveal. 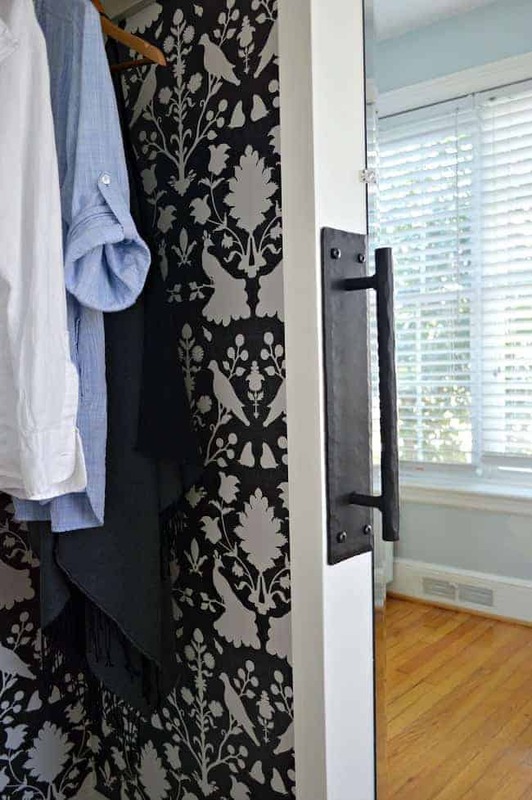 Just wondering….do you have to slide open the bathroom door to allow the closet door to slide open? I only see one track for both doors. 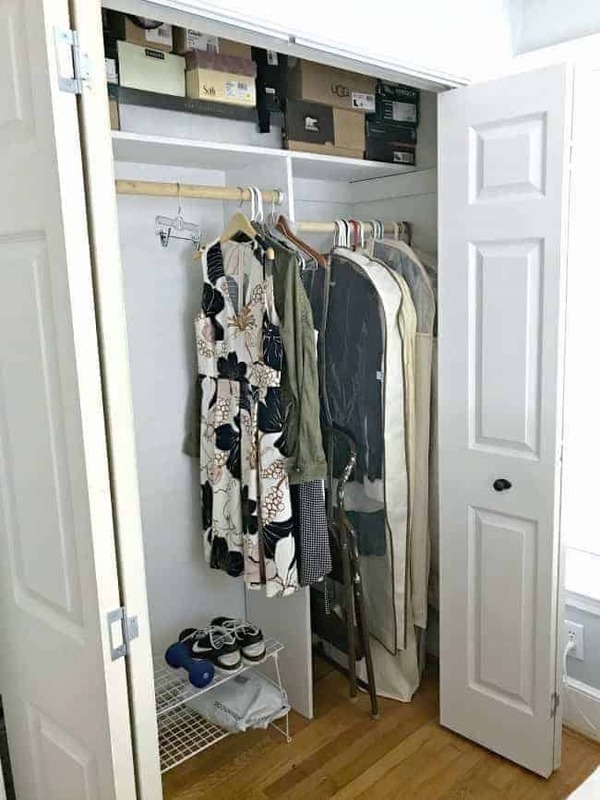 Yes, the bathroom door needs to be open a little bit in order for the closet door to open (although we do have a stop on the closet door so it only goes so far. We keep the bathroom door open all the time anyway, unless someone is using it. Hope that helps! Great job! This looks amazing! I’ve been wanting to make a sliding barn door! It looks amazing. This is a great solution for a door! The closet and powder room turned out great, Kristi! Love the barn door! Wow! Fabulous job. You are really talented. Can’t wait to see it! Thanks Darlene! Excited to share the whole project. It looks wonderful, i love your door and the cute wallpaper for the closet. I think you guys are very smart. Wow! i love it! So much work went into all of the details and it shows. I bet you will love this bathroom when it is up and functioning. What a great use of old doors. They are solid wood and so much better quality than most today. I love the handles and the barn track. I was wondering what your plans are for the bedroom. Will it be a bedroom or an office? Looking forward to the bathroom reveal. I haven’t seen your full bathroom. Did you do work to that also? Thanks Julie, I appreciate it! The door turned out to be a lot more work than we though but the idea was to do it on a budget and this was definitely budget. 😉 As for the bedroom…I’m not sure what I want to do with it. I had a bed in there but it hasn’t been slept in since we moved in. I’d like to better utilize the space since the house is so small. I thought about a project room for me but I just haven’t worked it all out in my head. It turned out great! It was lucky that you had that “dead” space to work with. Can’t wait to see the powder room. Small homes can be a challenge sometimes. Believe me, I know!???? Thanks MJ! We were really lucky we had a little bit of dead space. It all seemed to work out and it feels like our new spaces were always a part of the house. Small, older homes are a huge challenge. Glad this one is behind us. What a beautiful closet. I’ve been waiting anxiously to see it finished and it doesn’t disappoint. It’s a shame that it’s hidden behind a door – but the door is amazing also. You and your husband do such good work and are so good at making modifications. Can’t wait to see the powder room. What you’ve shown so far is wonderful. Thanks so much Pat, I appreciate it! I’m really happy with the way it turned out and love seeing my wallpaper every time I open the door. It was definitely a good move to use it in the closet. 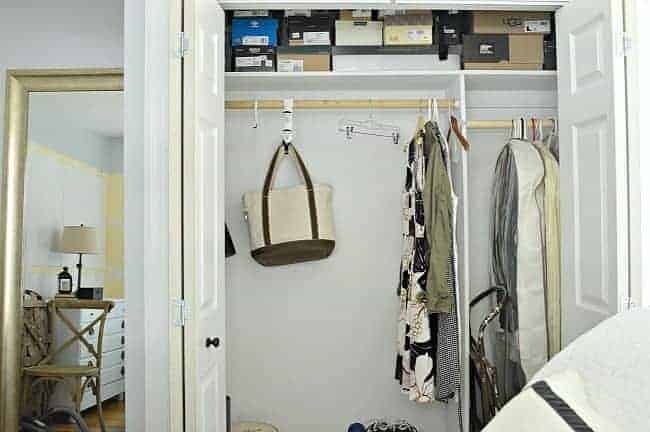 How nice your closet looks! Great job and worth the wait. I know it gives you great satisfaction to be finished. Can’t wait for the bathroom revile. Thanks so much Brenda! Yes, we are happy we are done with this project and thrilled with the way it turned out.